Heavy Vintage Analog Front End with most of the usual suspects. Everyone is searching for experience and experiences, and if you are a musician, band or ensemble recording this moment in time at Frogville IS that pearl of wisdom many search for eternity, but we are right up here at the foothills of the Rockies in Santa Fe, New Mexico, USA. The Big Room is grand with a 17 foot ceiling and the Motown 1 second reverb giving the perfect live sound for and voice or ensemble or strings or a full mariachi band with horns or any rock band who wants to record live and get the biggest, best drum sounds you have ever recorded. 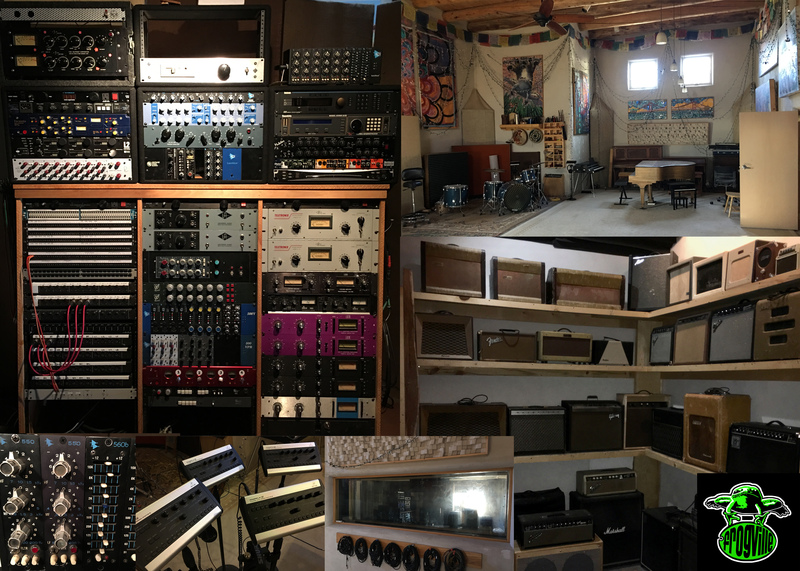 We have an isolated vocal booth, an amp room filled with vintage tube amps, mic closet, under the stairs… there are many places to stash / mic amps for separation in order to capture the magic for the best live recording possible. Frogville owns a bunch of great analog gear. A legacy 1957 EMT plate reverb that lived at RCA studios in NYC until 1971 then Wally Heider added it to his west coast arsenal and it was owned by a series of famous singers in their private studios before we bought it from Ben Sneezby of BeesKnees microphones before he moved back to Australia. We also own a Hammond C3 from Chuck Berry’s Memphis studio. We also have use of a vintage Marshall Plexie Super Bass 100 just like Duane Allman and Jimi Hendrix used along with 35-40 vintage tube amps in our collection. For the artists Frogville has just upgraded to a 16 channel personal headphone mix system so everyone can dial in just the way they each want it, click or no click. Did I mention the upstairs bunkhouse that sleeps 5 adults or 10-12 hippies comfortably, laundry, kitchen, 360 mountain city lights views..? usb keys for midi etc..